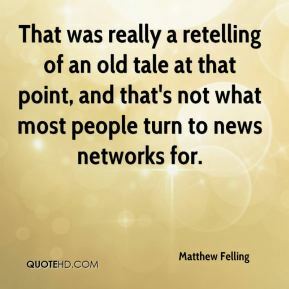 That was really a retelling of an old tale at that point, and that's not what most people turn to news networks for. 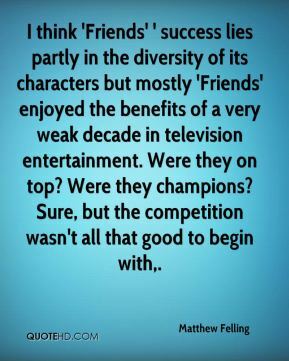 I think 'Friends' ' success lies partly in the diversity of its characters but mostly 'Friends' enjoyed the benefits of a very weak decade in television entertainment. Were they on top? Were they champions? Sure, but the competition wasn't all that good to begin with. I don't think Katrina is the turning point so much as 2005 is the turning point. It's an accumulation of things. 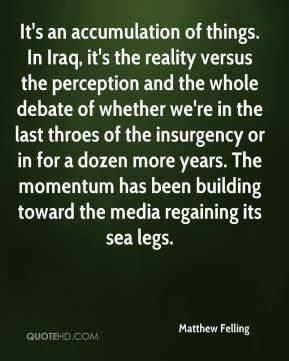 In Iraq, it's the reality versus the perception and the whole debate of whether we're in the last throes of the insurgency or in for a dozen more years. The momentum has been building toward the media regaining its sea legs. Advocacy is calling for action. 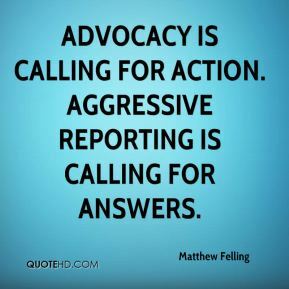 Aggressive reporting is calling for answers. 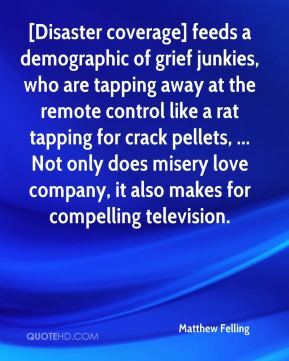 [Disaster coverage] feeds a demographic of grief junkies, who are tapping away at the remote control like a rat tapping for crack pellets, ... Not only does misery love company, it also makes for compelling television. This is a rough story for journalists to cover because your journalism textbook has to take a back seat to your moral compass, and the coverage is visceral because of this. 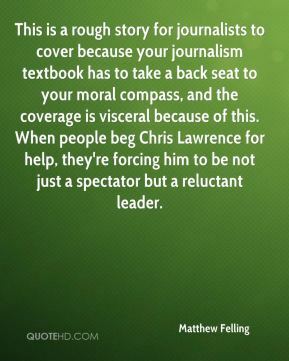 When people beg Chris Lawrence for help, they're forcing him to be not just a spectator but a reluctant leader. The media's credibility takes a short-term hit with these public corrections. 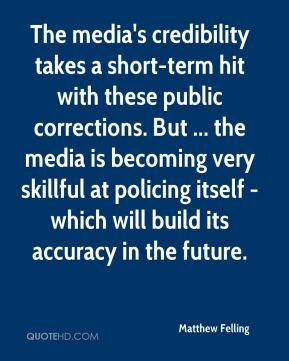 But ... the media is becoming very skillful at policing itself - which will build its accuracy in the future. 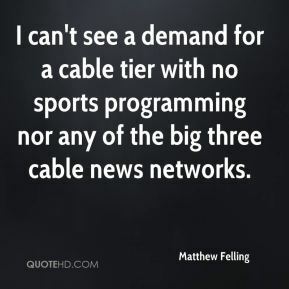 I can't see a demand for a cable tier with no sports programming nor any of the big three cable news networks. 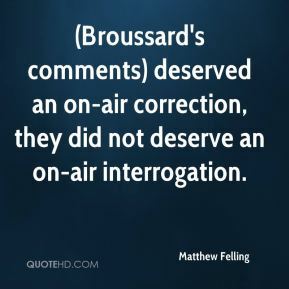 (Broussard's comments) deserved an on-air correction, they did not deserve an on-air interrogation. 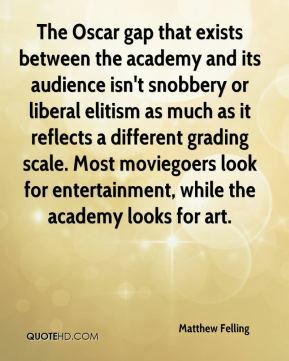 The Oscar gap that exists between the academy and its audience isn't snobbery or liberal elitism as much as it reflects a different grading scale. 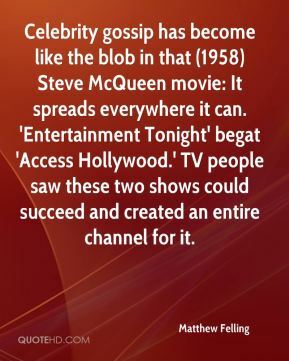 Most moviegoers look for entertainment, while the academy looks for art. 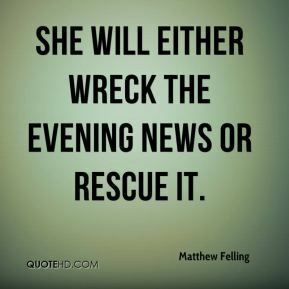 She will either wreck the evening news or rescue it.